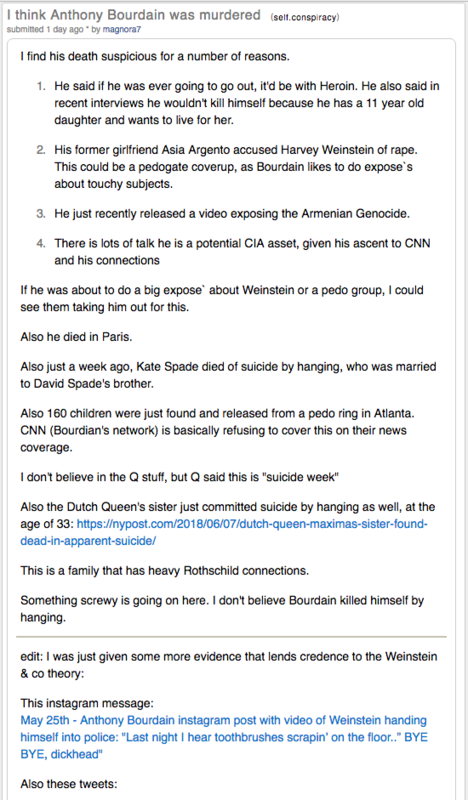 UPDATE: Anthony Bourdain’s death is no suicide. It’s a Mossad Murder. We totally agree with the explanation provided in the screenshot below by a reddit commentator. 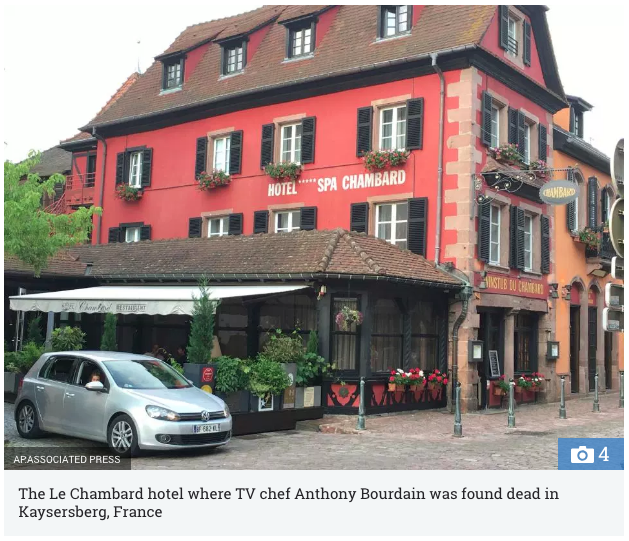 Does anyone really believe that Anthony Bourdain hung himself in this quaint little French hotel without leaving a single warning or clue? He gave no indication whatsoever of committing an act of suicide. Most significantly, he just was not the type to take such a radical leap that was so contrary to his nature. 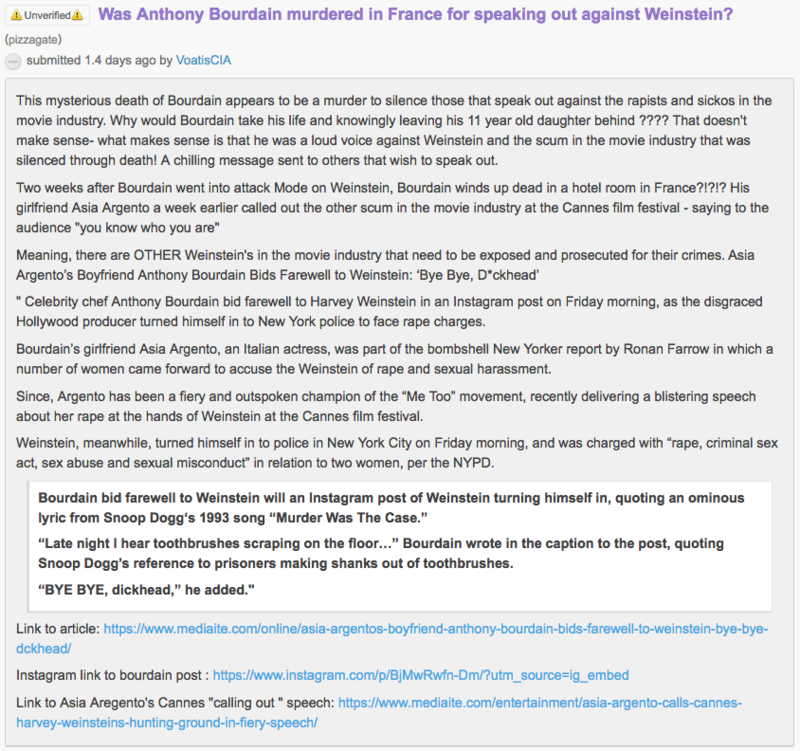 What is especially suspicious about this Illuminati hit is that “CNN said Bourdain was in Strasbourg filming an upcoming segment in his series “Parts Unknown”. When was the last time someone so engaged with and enthusiastic about their work killed him or herself ON THE JOB. Like so many other so-called suicides, this one just doesn’t add up. What does make sense is that Anthony made a bunch of VIP enemies and showed no signs of slacking off in this regard. Moreover, it’s as though he got bit by the truth bug and he was going to expose it however he could. The following screenshot details more of the back story of what was really a rapidly exploding public feud. Infowars also has an important perspective on this murderous affair as follows. Alex Jones provides critical insights into the awakening that Bourdain was quickly experiencing and then sharing with the world via his high platform at CNN. It’s quite true that the Illuminati can no longer control their countless pawns who populate the societal landscape. Virtually every cultural icon, corporate titan and so-called “star” is a creation of the Illuminati-conceived, CIA MK-Ultra mind-control program. However, many of these folks are now leaving the Pedogate plantation. The Hollywood, Music and Pro Athlete ‘stars’ are especially experiencing breakdowns in their programming. Several MSM talking heads and print reporters are now displaying lapses in the strict control that the CIA typically exerts on all major networks and news outlets. As a consequence, cultural influencers such as Kanye West and Elon Musk and Anthony Bourdain are speaking truth to power like never before. Whether you agree with his politics or not, when a powerhouse like Anthony Bourdain escapes from this plantation, it sends a signal to many others looking to bust out. More and more we see the brave slaves to the SYSTEM taking back their power, standing in their own truth and speaking that truth to power. Anthony Bourdain was essentially setting himself up to be the “Spartacus” of the Third Millennium. If there’s a silver lining in this dark cloud it is this: the naked assassination of an emerging hero like Anthony Bourdain will inevitably elevate him to a kind of cultural martyr status. After all, he knew exactly what he was getting himself into. And that takes an inordinate degree of courage because you never know when or where or how they will take you out. There’s no question that this duo — Anthony & Asia — had completely left the reservation of political correctness. 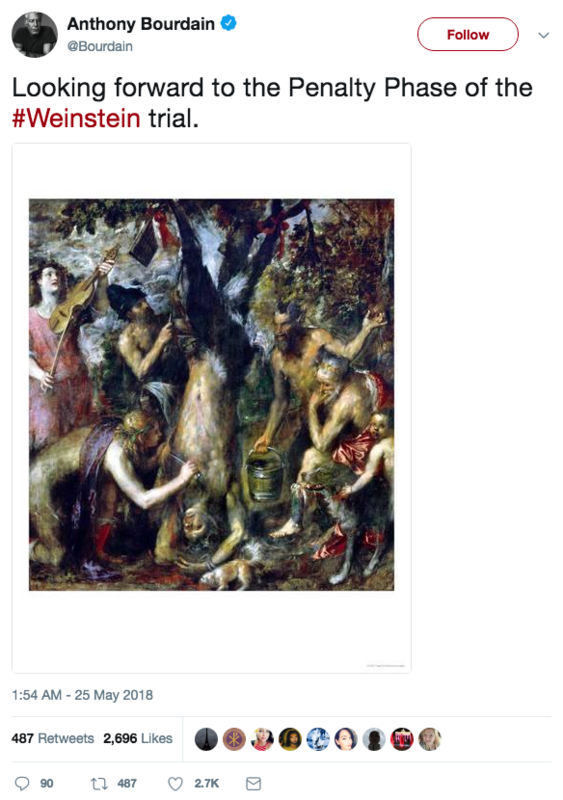 Not only had Asia already gone totally rogue on the Hollywood Pedogate scandal, she has shown more fang in the establishment forums than anyone else in the #MeToo movement. View this video in order to really understand just how deep into the swamp Asia had gone. 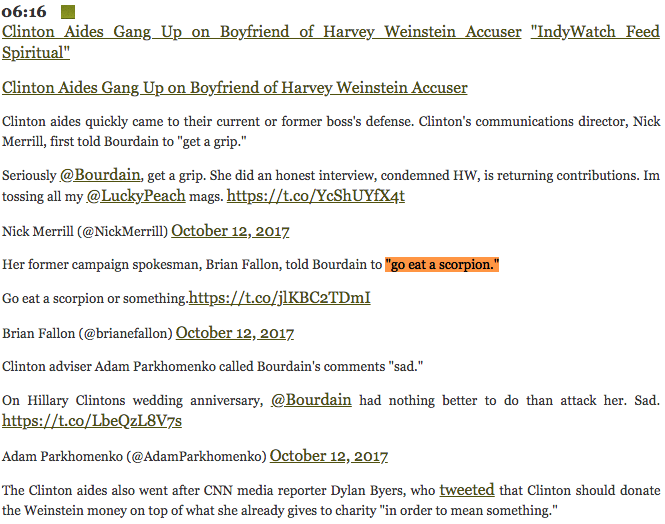 The screenshot below offers crucial insights on Anthony Bourdain’s girlfriend — Asia Argento — a #MeToo firebrand of the highest order. Now here’s Anthony Bourdain’s reaction to Asia Argento’s speech at Cannes. It ought to be obvious that Anthony greatly empowered his girlfriend to take on the Hollywood elites… right on their own turf. This has NEVER happened before…and will probably never happen again now that the Hollywood mob has murdered Anthony. Now here’s the real kicker, as if the foregoing list of grave offenses against the establishment was not serious enough. So taken in by the true story of the outright genocide of the Armenian people during the second decade of the last century, Anthony had talked about a made-for-TV production exposing the facts as they have never been disclosed before–by the Armenian people themselves. The crucial point here is that Anthony Bourdain had made one too many enemies, and on so many fronts that the power elite felt genuinely threatened. The Illuminati will never hesitate to take out anyone who crosses their red lines. It appears that the courageous Bourdain crossed many just this year alone. Side Note: What even Anthony Bourdain’s closest associates were totally unaware of is that he was only now coming into his own. Being a world famous chef, travel documentarian, TV producer, director, and writer, as well as a prolific author were but a preparation for the next stage of his life. As Anthony approached 62 years old, he set himself on a new life’s mission of truth-telling which put him in direct opposition to the power elite. Because he enjoyed such a high platform in the mainstream media (CNN), the elites would not allow an awakening soul to exert the powerful influence on society of which he was capable. This meticulously planned murder of Anthony Bourdain was designed to do one thing more than anything else. It’s purpose was to send a strong message to every other famous TV personality and Hollywood star that going rogue WILL NOT BE TOLERATED. It was quite obvious to everyone who knew Anthony that he would never take his own life. This is precisely why the authorities concocted such a ridiculous and implausible suicide story; they knew that everyone who needed to hear it would get the message. Of course, his girlfriend Asia got the Illuminati warning loud and clear. Just like they hospitalized Kanye West (in a psychiatric ward) after he let loose with some hard truths from the stage, and the media has been going after Elon Musk with a vengeance after his searing criticisms of the perilous AI takeover of the planet, the Illuminati has shown that they will not permit any disobedience. It appears that the Illuminati henchmen can no longer get away with suiciding their victims with 3 bullets to the back of the head. It just a tad too suspicious and puts local law enforcement in a very difficult position. Now these ‘ace’ hitmen are hanging even their very tall prey with bath robes in French hotels notorious for their low ceilings. Only a French investigator like Inspector Jacques Clouseau could explain such an extraordinary suicidal feat. The entire staff at The Millennium Report expresses their deepest condolences to the family and friends of Anthony Bourdain. His exemplary self-sacrifice, courage and initiative can serve as an inspiration to us all. Thank you, Anthony, for lighting your torch so that the rest of us can light our torches and pick up our pitchforks.